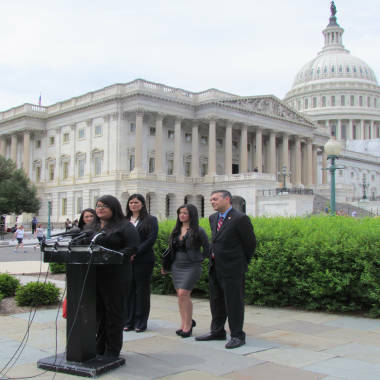 Daniela Peleaz, a graduating senior at a Miami high school, speaks in favor of the STARS Act, outside Capitol Hill on Wednesday, May 30, 2012. With her from left are Christina Caicedo (assistant to Nera Shefer), immigration attorney Nera Shefer, Dayana Pelaez (Daniela's sister) and Rep. David Rivera, R-Fla.
A little more than two months after she came close to being deported, high school valedictorian Daniela Pelaez joined a Florida congressman on Capitol Hill on Wednesday as he introduced a bill to allow undocumented students to remain in the U.S. if they get a college degree. 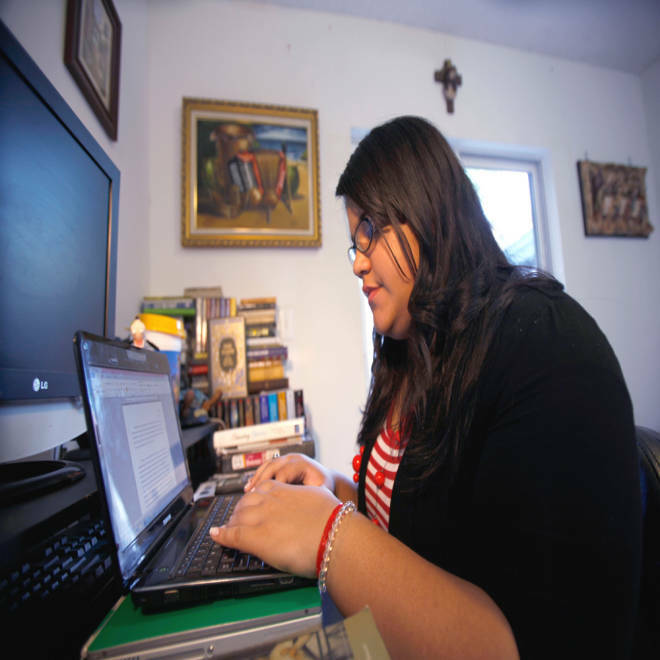 The Studying Towards Adjusted Residency Status Act, or STARS, would help students like Pelaez, whose parents are illegal immigrants and who has been in the U.S. since she was a young child. “It would be amazing. It’s the only concrete solution people like myself and other kids (in my situation) have to stay in the U.S.,” she told msnbc.com in a telephone interview on Wednesday before heading to Capitol Hill. U.S. Rep. David Rivera, R-Fla., worked with Pelaez, who lives in Rivera’s 25th District, and her attorney, Nera Shefer, in drafting the bill. The STARS Act would allow illegal immigrants who are 19 years old and younger, arrived in the United States before age 16, and have lived here for at least the previous five years the opportunity to stay for another five years and eventually get legal status if they earn a college degree and meet certain other criteria. “This legislation can make the American dream a reality for young people like Daniela, who through no fault of their own, are prevented from realizing their full potential in this land of opportunity," Rivera said on the House floor. Daniela Pelaez, valedictorian at North Miami Senior High School, works on a school assignment at her home in Miami in March. Pelaez, 18, is valedictorian of her class at North Miami Senior High School and boasts a 6.7 GPA. She graduates next Friday and plans to attend Dartmouth College in New Hampshire in the fall to study biology and history. Her career goal is to attend medical school and become a heart surgeon. Pelaez has become a sort of cause celebre for immigration reform and now is a poster child for STARS, which is a narrower, refined version of the DREAM Act. More than 1,000 students at North Miami Senior High School in Miami protest the deportation order for 18-year-old Daniela Pelaez, the school's valedictorian. WTVJ-TV's Jeff Burnside reports. The Dream Act, which would open a path for citizenship for children of illegal aliens, has been stalled in Congress since it was introduced nearly 11 years ago, the victim of partisan political bickering over immigration reform. Under the act, undocumented immigrants who arrived in the U.S. before they were 15 must complete two years of higher education or two years of military service. It is not required that they graduate. Shefer said the STARS Act targets a much narrower population and could affect about 2 million teen students who don’t have legal status. Rivera said Pelaez’s plight inspired him to develop STARS. "Many young immigrants have found themselves stuck in limbo due to our failure to address immigration reform," he said. Pelaez was 4 when she and her parents came to the U.S. from Colombia in 1988 and stayed after their visas expired. Her father eventually became a permanent resident through her brother, who serves in the U.S. Army and achieved U.S. citizenship. But her mother is stuck in Colombia, after she returned there in 2006 for medical reasons. Pelaez says she has few memories of Colombia and doesn’t want to go back. Pelaez’s life was nearly upended in late February when a judge denied her request for a green card and issued an order for her to leave the country. National and international media picked up the story, and soon Pelaez found herself surrounded by supporters at school, in Congress and in the federal government. At North Miami High Senior School, Daniela’s classmates walked out of class and took to the streets on March 2 to protest the immigration judge’s order. "Over my dead body will this child be deported," Miami-Dade County Schools Superintendent Alberto Carvalho said. The public outcry had an effect: The Obama administration decided to defer action on the case for two years -- meaning Pelaez and her older sister Dayana will be able to stay in the U.S. without fear of deportation for that period. It’s in keeping with the administration’s decision, announced last summer, to focus its deportation policy on illegal immigrants with criminal records and no longer actively seek to deport non-criminals. "The foundation is recognizing that we are here -- these students are undocumented and want to have the American dream,” Palaez said. America, she said, is where her roots are.